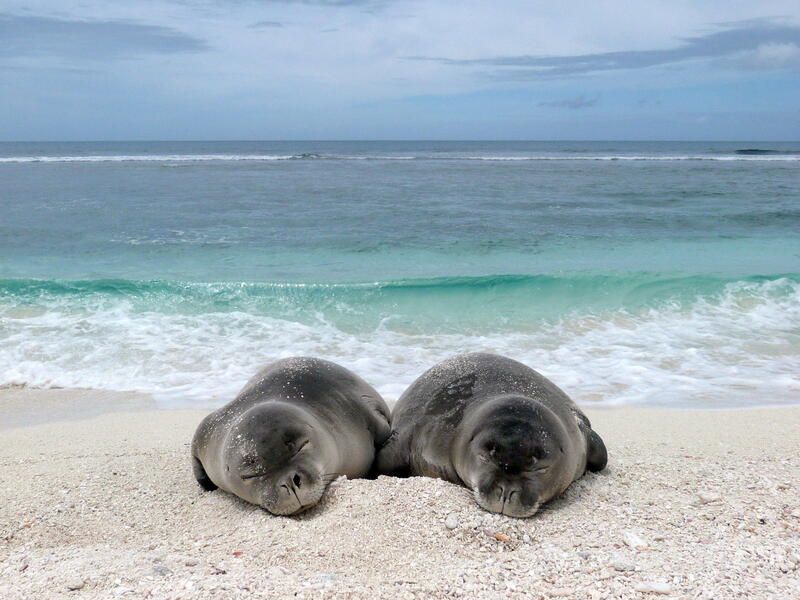 Two weaned Hawaiian monk seal pups sleeping at French Frigate Shoals in the Northwestern Hawaiian Islands. New data reveals some good news for Hawaiian monk seals. According to the National Oceanic and Atmospheric Administration, population numbers for the endangered species are on the rise. HPR’s Molly Solomon has more. It’s feeding time at the Hawaiian monk seal exhibit at Waikīkī Aquarium. A crowd of children peers into the water tank as Ho’a, one of the aquarium’s two seals, feasts on a lunch of whole fish. After a decade of conservation efforts, experts predict a brighter future for seals like Hō‘ā. Recently released population estimates show there are now 1,400 seals throughout the Hawaiian Islands. That’s a hundred more since last year. “Breaking down that number, it’s 1,100 in the Northwestern Hawaiian Islands and roughly 300 in the main Hawaiian Islands,” said Charles Littnan, the lead scientist with NOAA’s Hawaiian Monk Seal Research Program. He said the population has been increasing 3 percent each year for the past three years. Over the last three years, juvenile survival rates have greatly improved. 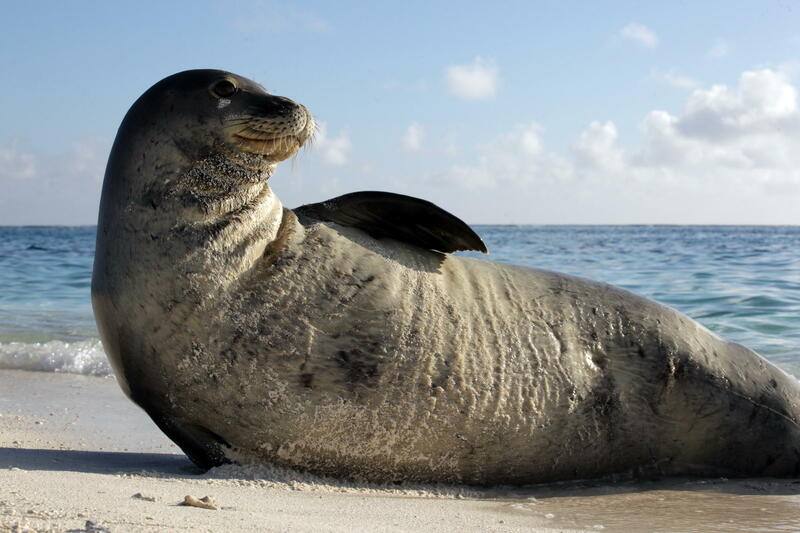 Historically, less than one in five monk seals survived into adulthood. That uptick is largely due to action taken to disentangle seals from marine debris and rehabilitation programs for malnourished seals at a Kona seal hospital on the Big Island. Littnan believes about 30 percent of the current seal population are alive today because of these efforts. But Littnan says the critically endangered species still has a long way to go to reach full recovery. 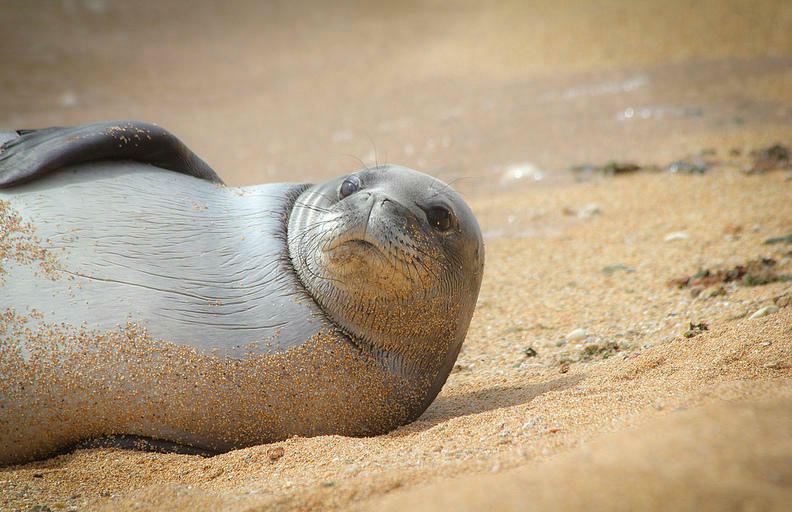 Current numbers are only about one-third of historic Hawaiian monk seal population levels. Researchers say the endangered Hawaiian monk seal population is on the rise. But so is the threat of a fatal virus that could wipe out the native species if it reaches Hawai‘i. HPR’s Molly Solomon reports on new efforts to prevent a future outbreak. In case you’ve ever wondered how to vaccinate a wild Hawaiian monk seal, the first thing you’ll need is one of these. “This is a pole-syringe,” said Michelle Barbieri, holding up a 4-foot long spring loaded pole. She’s a veterinarian for the National Oceanic and Atmospheric Administration’s Hawaiian monk seal program. A 14 year old Hawaiian monk seal is back in the water after a lifesaving surgery to remove a fishing hook he swallowed. Scientists from the National Oceanic and Atmospheric Administration released RE-74, also known as Benny, after a two-week recovery period. Two endangered Hawaiian monk seals have been nursed back to health at the Marine Mammal Center’s Hawaiian Monk Seal Hospital. After spending the past five months at the Kona facility, they were recently returned to their home in the Northwestern Hawaiian Islands. And as HPR’s Molly Solomon reports, this success story is important in maintaining the survival of this critically endangered species.